An egg is quite possibly the world's most perfect food –ok that other David might argue it's chocolate, but his days are numbered. An omelette is quite possibly the world's most perfect way to cook eggs. Hardly anyone would argue with me on this one, yes? 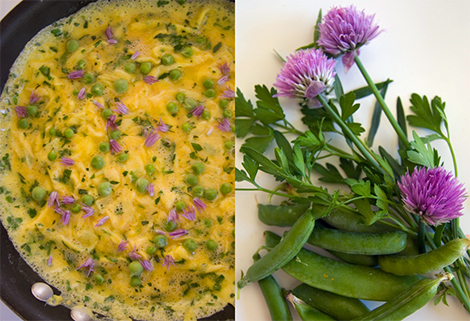 Have you had the French classic, Omelette aux Fines Herbes? Basically it's just a simple omelette but with an addition of chopped fresh herbs –usually parsley, chive, tarragon, and chervil in about equal amount. I think that's quite possibly the world's most perfect seasonings for an omelette. But even the quite-possibly-the-world's-most-perfect-anything can be improved upon. And one idea came to me when I was at the garden this morning. Strolling around chomping on bits of odd lettuce and leaves, as is my habit while in the garden, I came upon some chives on the herb patch. They are growing like weeds, and some have even gone to flowers. Have you seen chive flowers? They are bright, round, purple clusters comprised of cutesy little blossoms. I picked one up and took a bite -tasted just like chives, perhaps a tad more delicate. So I decided to see if I could make an omelette with them. Cynthia, our lovely gardener, went to the chicken coop and brought me a few eggs, still warm from the perfectly fashionable hens we keep. I made a pretty omelette, with the fines herbes –sans chervil because I perfectly forgot- adding the chive flowers at the last minute because they're more delicate than the green part. We harvested a big basket of the sweetest green peas earlier, so I stole a few and added the tiny peas to my omelette at the last minute. The peas were like surprising bursts of Spring when bitten into. Even the quite-possibly-the-world's-most-perfect food can do with a little twist. How about you? What twist have you put in your perfect omelette lately? Chopped, mixed fines herbes –use equal amount of parsley, chive, tarragon, and chervil (or any combination of them as well as other herbs you like). How much herbs do you put in your perfect omelette is entirely your own business. Of course you know how to make a perfect omelette, and how to twist even. But in case you need an instruction Delia has a great one, complete with photos. She can help you. Now you can tell me how perfect your omelette is too.